LottoPalace holds a lot of promise, and it’s a good site for players seeking variety. LottoPalace offers a respectable selection of lotteries, as well as an impressive array of alternatives like virtual scratch cards and instant win games. If you’re easily bored, LottoPalace might be the answer to your prayers. There are some snags that keep me from giving LottoPalace a higher ranking, though: limited payment methods and language options top that list. These aren’t big issues, but they can definitely take away from LottoPalace’s merits when you consider that many lottery websites do better in these areas. That said, LottoPalace shows a lot of promise. If you’d like to try a variety of push-your-luck games while still getting your lottery fix, give LottoPalace a try today. LottoPalace is an online lotto betting site and occasional lottery agent. It’s owned and operated by Altair Entertainment N.V., a gaming company that’s licensed by the Curacao government. LottoPalace offers 13 lotteries, group games, as well as virtual scratch cards and other alternative games. LottoPalace is a hybrid lottery site. It operates mostly as a lotto betting site, meaning you don’t join the official games but bet on their outcomes instead. Big prizes are paid out by a third-party insurance provider that covers the betting games. Once jackpots exceed €50,000,000, though, LottoPalace starts operating as a lotto agent. This means it starts buying official tickets on your behalf. Any jackpot wins will then be claimed from the lottery operator. LottoPalace lets you bet on the outcomes of lottery games. 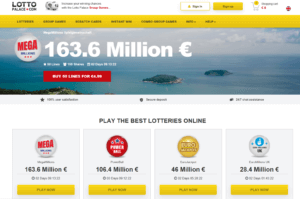 Once jackpots for these games exceed €50,000,000, though, LottoPalace shifts into lottery agent mode: instead of bets, your purchases will net you official tickets to the lottery games instead. Solo play: You can buy up to 6 tickets for the current draw in one go. .Group play: You can buy shares in a syndicate. LottoPalace also lets you buy ahead for multiple draws. If you want to keep entering draws indefinitely, you can sign up for a subscription instead. I discuss these in more detail below. Just know that you’ll never get bored at LottoPalace. LottoPalace has a short registration process. LottoPalace asks for your email, preferred password, full name, date of birth, and mobile number. If you’d like to speed up the process, you can also sign in with your Facebook account instead. For registered users, there’s a login button at the top of the website. LottoPalace doesn’t offer many promo codes. LottoPalace offers 13 different lotteries, from blockbusters to lesser-known games. LottoPalace offers a varied, if small, selection of lottery games. You’ll find the usual suspects like the US Powerball and US MegaMillions alongside smaller games like the Irish Lotto or Australia’s Oz Lotto. This is great if you’d like to mix up your game choices and try your hand at less popular lotteries. Some of the European lottery staples are missing, though. For example, you won’t find the SuperEnaLotto, surprisingly enough. Meanwhile, the France Lotto is only available as a syndicate game. You can buy up to 6 tickets in one go. If you’d like to play in advance, you can buy ahead for 8, 16, or 24 draws. You can also sign up for a subscription. LottoPalace reports results for 15 different lotteries. You’ll find results for all the lottery games that LottoPalace offers, as well as extras like the UK Thunderball. Most results are found at the bottom of the LottoPalace homepage. There’s also a handy link to take you to the main results page. Conveniently, LottoPalace lets you view results from previous draws just by choosing a date from a dropdown menu. LottoPalace offers 10 virtual scratch card games. LottoPalace offers different scratch cards than what you’ll usually see at other lottery websites. The concept is the same, though: Buy a card, see what it holds, claim a prize if you win. One of the scratch cards they offer. The great thing is that most of these cards are very affordable. The cheapest one, for example, costs €0.05 per card. Meanwhile, prizes can go as high as €100,000. LottoPalace spices up its game selection with 10 video game-like instant win offerings. LottoPalace’s instant win games feel exactly like video games where you can push your luck. The bonus? You can win actual money. 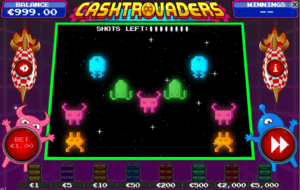 Cashtrovaders, for example, functions like the Space Invaders video game. You click on enemy spaceships to reveal icons. If you find 3 matching ones, you can collect a prize. 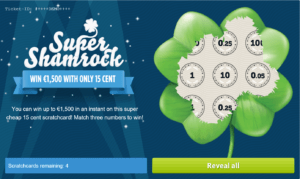 Instant win games offer a more interactive approach. Despite how frivolous these games feel compared to lotteries, they still offer some serious prize money. Winnings can go as high as €100,000 for some games. If you’d like to take a breather from lotteries and scratch cards, these are interesting alternatives. Take a break from betting and buying with 33 virtual games. Speaking of games, LottoPalace leans hard into alternative offerings with luck-based games that don’t involve any money. You can try any of 33 games that range from dice-rolling to roulette to simple gift selection. LottoPalace offers 12 syndicates and 1 combo group game. LottoPalace carries syndicates for almost all the lotteries that they offer for solo play. You’ll also get a syndicate-exclusive game: Lotto France. All syndicates offer 150 shares and 50 lines or tickets per set. Better yet, these are actually some of the more affordable syndicates you can find online, with shares costing less than €10 each. Interested in US lotteries? LottoPalace offers a convenient combo group game that lets you play both the US Powerball and US MegaMillions with one purchase. There are 150 shares and 100 lines/tickets per set. No, LottoPalace isn’t a scam. It’s owned and operated by a Curacao-based company, and it holds a legitimate gaming license from the Curacao government. All lotto betting operations are covered by a third-party insurance provider that’s responsible for paying out prizes. For larger jackpots, LottoPalace buys official tickets, so you’re assured of a payout if you hit the jackpot. Yup, LottoPalace is run by a legitimate company called Altair Entertainment N.V. It operates out of Curacao, and it holds a gaming license from that territory’s gambling commission. Definitely. LottoPalace boasts a 256-bit Comodo SSL encryption for all actions and transactions on its website. They’ve also got a payout guarantee that assures you of full transpareny when it comes to the disbursement of winnings. Is LottoPalace a real or fake company? LottoPalace is definitely real. It’s operated by a legitimate company (Altair Entertainment N.V.) which holds an up-to-date gaming license from the Curacao government. LottoGopher is owned and operated by Altair Entertainment N.V., which is based in Curacao. How does LottoPalace make money? LottoGopher doesn’t charge commissions for your winnings. Instead, it adds handling fees to its ticket prices. Since part of LottoPalace’s operations involve lotto betting (meaning they don’t have to buy official tickets from a lottery operator), their ticket prices can still be relatively low. Yes, LottoPalace is legal. It carries an up-to-date gaming license from the Curacao government, meaning it adheres to an established set of laws and regulations. Does Lottery Critic Trust LottoPalace? Sure, we do. LottoPalace protects all website transactions with a 256-bit Comodo SSL certificate, and the company carries a gaming license from the Curacao government. This is as secure as you can expect from most lottery websites. LottoPalace’s payout system is pretty standard. For prizes beyond $600, you’ll have to collect the money from the lottery operator yourself. You can arrange to have the ticket sent to you via courier, or you can collect the ticket from a LottoPalace representative in the country where the lottery operator is based. Both options can be quite inconvenient, though, especially if you live far from the lottery operator — either way, you’ll still have to travel. Depending on the size of your lotto prize, the collection process might end up costing more than what you’ve won. Prizes in Tiers 1 and 2 (jackpot and second prize) will require you to fill out a claim form. Once your form is received and processed, you’ll get the prize amount within 30 days. LottoPalace only supports 5 payment methods. The selection already pales in comparison to other lottery websites like theLotter, which offer over 20 payment options. LottoPalace disappoints further: 3 out of 5 of its payment methods are limited to 2 countries. Basically, if you’re playing from almost anywhere in the world, you’ll only have Visa and MasterCard. You can withdraw winnings just by putting in a request through your account’s payout page. LottoPalace sends money through cheque, credit card transactions, bank transfers, or other methods they might deem applicable. You’ll have to shoulder any transaction fees associated with your chosen payout method, though. Has anyone won on LottoPalace? Unfortunately, LottoPalace doesn’t provide any information about past winners or any of its biggest payouts. LottoPalace offers a mobile-responsive website for on-the-go lottery play. LottoPalace relies on a mobile-responsive website, which performs well enough on phones and tablets. You can buy tickets, check lottery results, and so on. However, it would’ve been better to get a dedicated mobile application for the added convenience. LottoPalace seems to have scaled back its customer support options to just email. LottoPalace used to have more support options. Currently, it seems you can only contact them through email (support@lottopalace.com). Some sections of their website still advertise a live chat option, but I didn’t get responses. LottoPalace also has a short FAQ that nevertheless answers most common questions. There are other helpful pages scattered throughout the site, like guides for buying tickets or understanding the basics of lotto strategy. Navigating LottoPalace’s website is a cinch, but it could use more language options. A single look tells you exactly what you can get from LottoPalace’s website. The homepage displays most of the games on offer, including scratch cards and instant win games. The navigation bar lets you hop quickly to all of the website’s important sections, too. You can only choose between 2 languages, but at least their website is simple and easy to use. I’m deducting points for LottoPalace’s limited language options, though. You can only get the website in English or German, which is a blow for people from other regions of the world. For a website that caters to an international audience, this is a tad disappointing. It takes less than a minute to buy tickets on LottoPalace. Clicking through to a lottery game takes you to the number selection screen. You can choose numbers for up to 6 tickets in one go. If you’re in a hurry, you can use LottoPalace’s random selection option to get a set of random numbers instead. LottoPalace gets top marks for game variety, but a few issues keep it from true excellence. LottoPalace offers a fantastic array of push-your-luck games. If you ever need a breather from lotteries or lottery syndicates, you can switch quickly to virtual scratch cards, instant win games, and even 30+ other virtual games, all on the LottoPalace site. However, LottoPalace doesn’t extend the same range of choices when it comes to language options or payment methods. That loses the company a lot of points, especially since LottoPalace intends to cater to an international audience. Still, LottoPalace shows a lot of promise, and if you’re looking for a change of pace, it’s a great website to try. Hey Dan, thanks for the info, and we’re sorry you’ve had issues with withdrawing money. We suggest continuing to email LottoPalace’s staff directly. Good luck! Das ist schwerer Betrug,Herr Fabian König,Herr Tobias Schmitt und Herr Tim Novak haben nur Versprechungen gemacht und mir mein ganzes Geld abgenommen.Leider habe ich vertraut und geglaubt,sie sind ja Super geschult. Im Moment liegt alles bei der Staatsanwaltschalt.Mir wurden 156,000 Euro versprochen,erhalten habe ich keinen Cent. Tut mir leid, von Ihrer Erfahrung zu hören, Monika! Wenn Sie hier weitere Details mitteilen möchten, tun Sie dies bitte. LOTTOPALACE IS FAKE!!! U Will never get your money!!! i am waiting for months and THEY DONT PAY ANYTHING!!! SO NEVER USE THIS FAKE SITE!!!! Hey, thanks for the feedback. Maybe you won more than $600 so LottoPalace might have expected you to claim the prize yourself? Either way, like we said in the review, LottoPalace’s payout system can be pretty inconvenient. That’s why we prefer alternative lottery sites like theLotter. Be sure to check out our reviews to find better lottery websites! lotteries in other countries. I came across your firm ( LottoPalace) on the internet which appeared to provide such service. I initiated a chat on the website to inquire if indeed they provided the service I was looking for and I was informed they did. purchase my tickets (€110) or thereabouts. purchase a Combo 3 bundle that would cost €390.00 Euro that would last for 12 weeks a cost I had not planned for. be quick so that he could get the tickets in. scratch cards or gamble with money of that size. Bank. He insisted that I should get the loan as he assures me that I would be able to repay it via the guaranteed winnings in the shortest time possible. requested by Mr. Robinson and the scratched bundle was then purchased but not played as he indicated he would instruct me when to play it. needed to be able to view my tickets prior to the draw as I would like to verify my lottery winnings myself. all 10 tickets for the week from his side and that I should not worry that if there were any winnings after the draw, the winnings would be credited to my account. no way of knowing for sure if I had won or not. He then replied I have to trust him. should trust the agent. I expressed my dissatisfaction with his suggestion but he claimed it was 5 pm and he had to go home. within 3 working days as a result of his misrepresentation, breach of your contractual duties and trust. networks across the internet warning others of my awful experience with your firm and to Beware. They never did respond to my email. I am still pursuing this matter relentlessly. Lotto Palace is a lotto betting site only, which means they don’t purchase tickets on your behalf. You’re simply betting on a game’s outcome. That said, it is weird that he didn’t just say that to you. Hope you get your issues resolved!